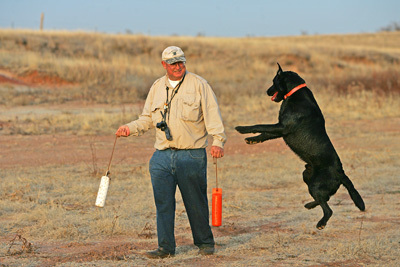 A started gun dog is a young dog between 8 months and two years old that has been exposed to birds; has good fundamental basic obedience; has a good basic retrieve on land and water, but is not force broke; has been exposed to guns and hunting situations, and is not gun-shy; and is ready to begin hunting. A started gun dog is a dog that shows promise as a hunting dog but is not fully trained. Prices for good started gun dogs usually range between $1,500 and $3,000. If you don't see a good candidate for your needs listed here, call us! We have connections with other breeders and trainers, and we can usually line up a good candidate for you.